Ho ho ho... it's time to start the Christmas decorating over here at Ten June! I am always excited about the holiday season, but I'm even more excited this year because David and I actually have a little bambino to share the holiday with! Granted, HDawg will be four months old and will have zero memory of opening gifts or sitting in Santa's lap (oh yes, that happened... pictures later this week! ), but it's still really fun to have him around to celebrate with us. One element that I crafted for my mantel are these glitter candles. Just like all of the crafty projects I do, these guys are simple and sweet. Here's the low down on the how-to! 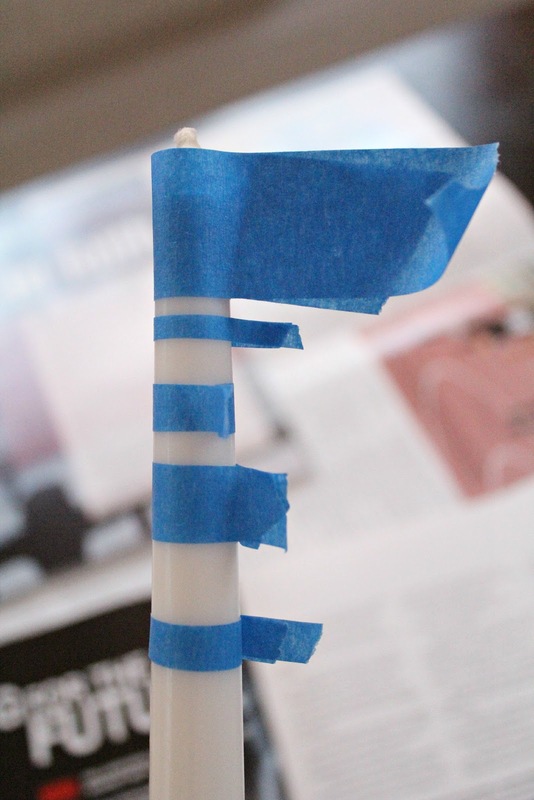 In order to paint the striped candles, I simply cut varying strips of painters tape and taped off each candle. At first, I really worried about how straight the tape was around the candle, but then I realized that once the glitter was on, you couldn't really tell if the stripe was straight or not. So then I loosened up and taped away until my little heart's desire. 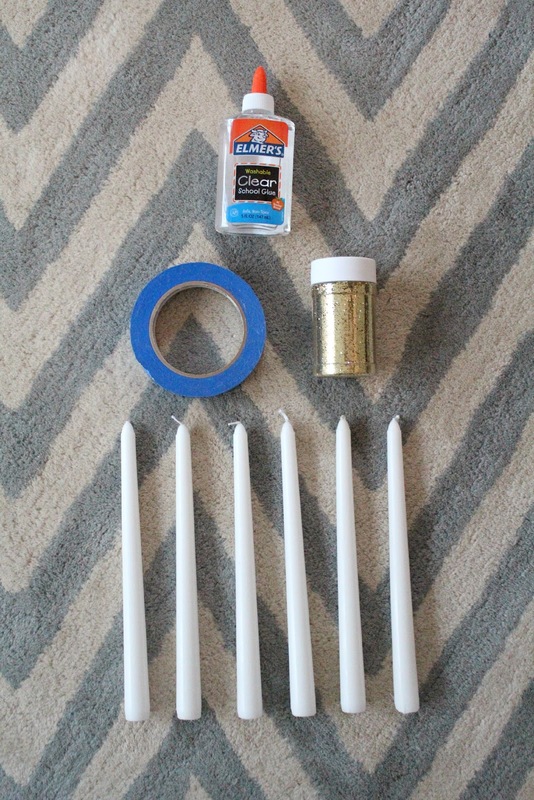 Then, you cover the exposed candle parts with clear glue (I used my fingers to rub the glue around, you could be fancy and use a paintbrush or sponge) and then pour shake out the glitter onto the wet glue areas. Then, you'll want to immediately peel off the painters tape before the clear glue that's on top of it now dries. You don't want the tape stuck to the candles! For the solid candles, I simply covered the entire candlestick with the clear glue and then added the glitter. Lots. Of. Glitter. Again, the glitter coverage doesn't have to be perfect- a little glitter goes a long way! 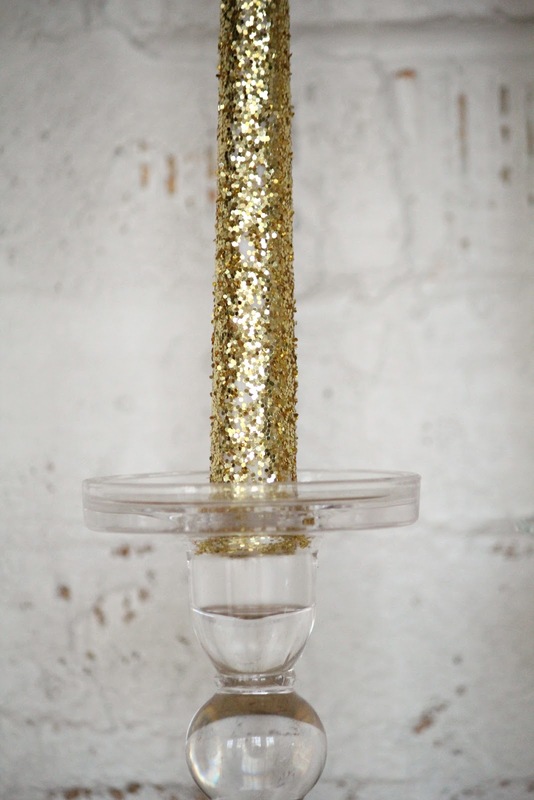 I thought about only doing the stripes around the top of the candlestick or not covering the entire candle in gold glitter. But then my sister reminded me that it is Christmas, after all. You can never have too much glitter at Christmas, right? Can I get an amen? Now these bad boys are sitting on my mantel, enjoying their golden glow. I can't wait for you to see the entire thing! The mantel decorations are completely out of my comfort zone, but I think they work. I went for a rustic glam look... sounds interesting, right? Want a quick sneak peek? So there you have it! My first Christmas project of the year. Have you been working on anything fun? 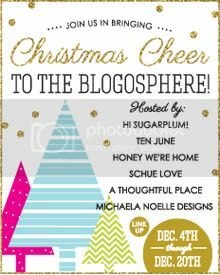 If so, make sure you head over to Cassie's blog to link up your favorite Christmas crafts! 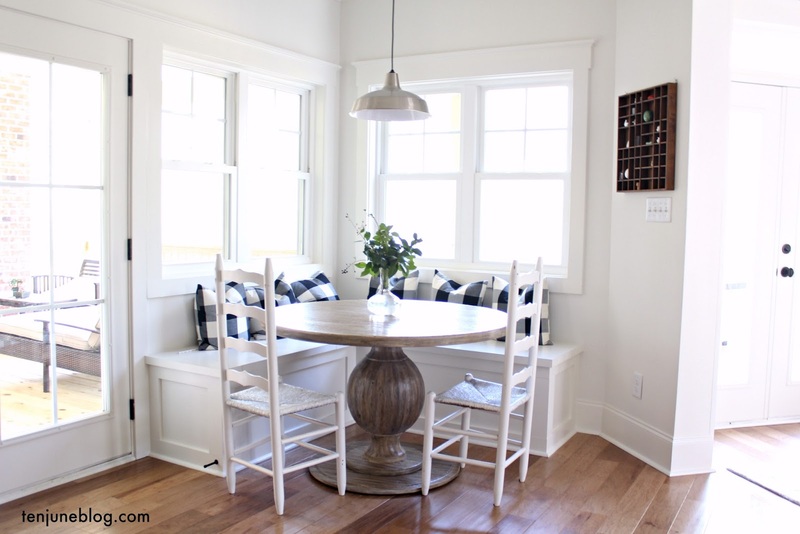 This is such a fun idea - love the stripes! Girl, those are so so cute!!! And we did similar photo backdrops! ;) I have gone way out of my comfort zone this year too. Not the easiest thing! I might sneak and swipe those! Oooo la la! I love these!! They're remind me of a Kate Spade inspired look! And I cannot WAIT to see the mantel! I'm super intrigued!! These are so pretty and sparkly!! Loove them!! 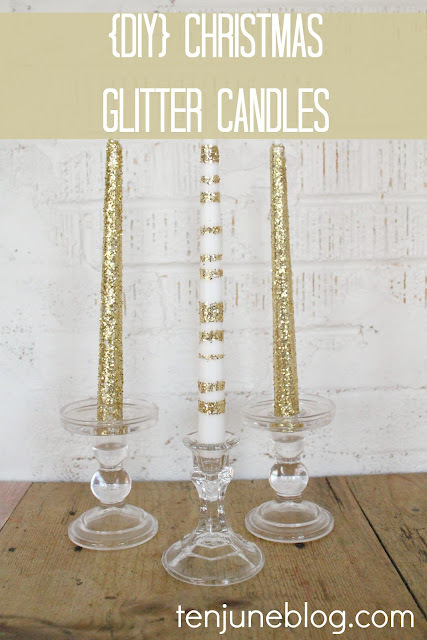 Glitter candles, get in mah house!! 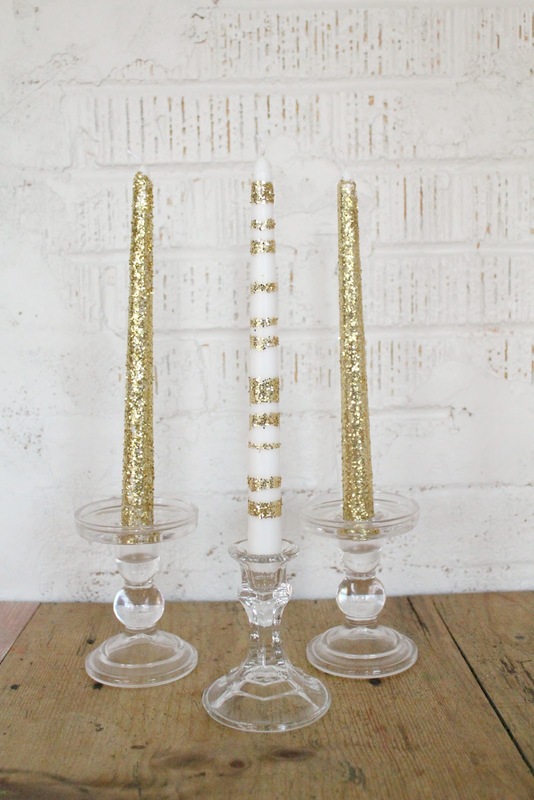 Love these & can't wait to see your mantel reveal. That snippet has me salivating. 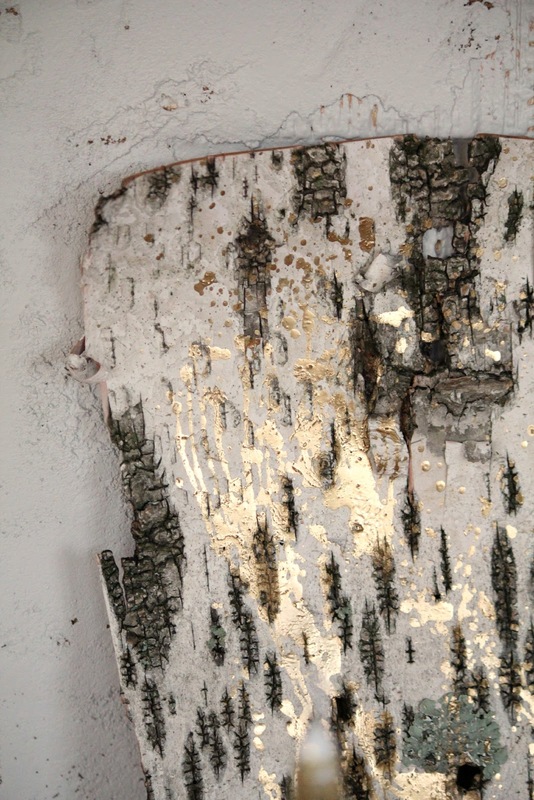 Rustic glam is my new obsession! Soooo so cute! 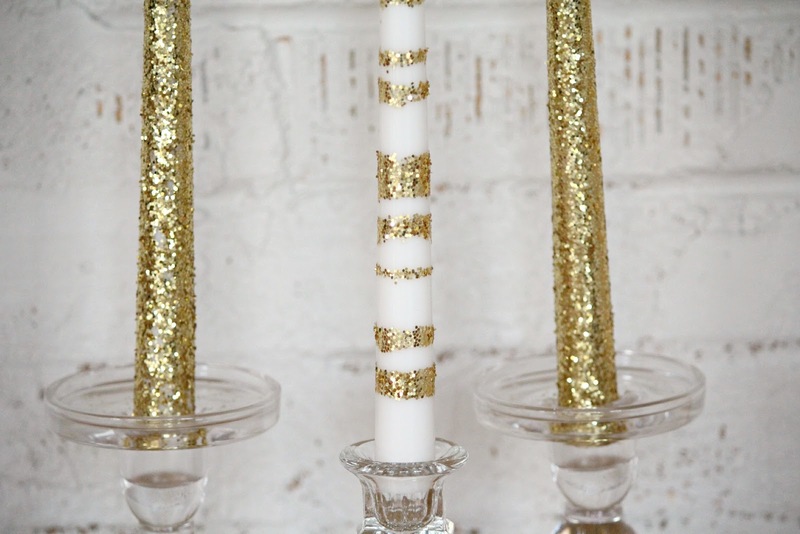 Love all that gold and glitter and stripes...it's a craft trifecta! And that sweet boy of yours is just growing like an adorable weed!! Love what you have done so far!! These candles are so simple and look fantastic! Can't wait to see what else you have in store!! Such a brilliant yet simple holiday DIY. I like that the stripes aren't perfect, it makes it that much more interesting. Awesome idea, Michelle and sooo simple! Can't wait to see your mantel! So good, Michelle! I made some of these last year, but not with stripes. The stripes are great! These are so pretty. I love the sparkle and the stories. Such a great and festive project.